Most persons who serve in the ministry in any capacity will have an occasion to use a microphone for public speaking, and consequently it is important to know something about their use. The most extreme example of this need can be illustrated by this real incident. In a neighboring church during a Sunday School promotion day, each teacher was asked to come to the pulpit to give a brief testimony. One elderly teacher, visibly nervous, came up and was handed the microphone. With shaking hands she took the mic, and to everyones surprise, she placed the mic up to her ear and began speaking! She had never used a mic before and thought she should hold it like her telephone receiver. Simply stated, a microphone changes sound waves into an electronic signal which is transmitted to an amplifier and then to speakers or perhaps a tape recorder. For the purpose of most singers or preachers, the type of microphone most commonly used will be a cardioid type, which has a narrow pattern of audio sensitivity. This unidirectional pattern will pick up sound from a source directly in front of it, but will tend to avoid sounds from other directions. This is helpful in preventing bleed-in to the mix from unwanted sounds or in the attempt to control feedback, etc. In those cases where you want to amplify sound from all directions an omidriectional mic is used. Besides these basic pattern characteristics, different manufacturers design specific characteristics and sensitivities into various mics for different purposes, such as amplifying musical instruments. Choosing the right mic is important to the nature of the desired results. Omnidirectional - Sensitive to sounds from all directions. Unidirectional - Sensitive only in one direction, usually a cone shaped pattern. Cardioid - A type of unidirectional mic, sensitive in one direction. It picks up sound in a heart-shaped pattern, strongly from front, and about half as loud from the sides. Test your microphone. What type of mic do you have? Speak into the mic head from the front and then from the side. If the sound is fairly even from all sides, you have an omnidirectional mic. If your voice fades when you speak from the side, you have a unidirectional mic. Mics are sometimes selected on the basis of how they generate the initial audio signal. Condenser type mics require an additional power source to operate  either with a battery or phantom power supplied through the cable from the sound board. They tend to be brighter, crisper and require less amplification. In contrast, a dynamic mic uses only the sound source to generate signals to be sent to the sound board. Wireless mics use a tiny transmitter to send audio to a receiver connected to a sound board. A limited variety of mic types are available for handheld or lavaliere use. These mics are great but are not without their drawbacks. They run on batteries (always use alkaline) which have to be changed regularly, are sometimes subject to transmitter interference or dropout (a lapse in the received signal), and do not offer the variety of types and qualities available to hardwired. A hard-wired mic is the standard type of mic which has a cable wired directly into a sound control board. Most mics used today are of a low impedance type (low resistance) which are resistant to interference and allow longer cable runs. A lavaliere (or lapel) mic is tiny, hardly noticed mic clipped on a persons clothing, great for amplifying speech, but not so good for the broad dynamic range of singing. Some preachers love these because they leave the hands free and no cords to dangle  others hate them because the sound is not as good as a larger, hand-held mic and there is no dynamic control over the volume (by lowering and raising the mic). As in many other things, with mics you get what you pay for. The better quality instruments are not cheap and they must be used together with good quality equipment and acoustics to produce the desired results. When used for vocal amplification, a microphone should be mounted or held within a tolerance of between 3 and 8 inches of the person. To keep a mic within these tolerances, a gooseneck or boom can be used on a stand or lectern to adjust the vertical/horizontal placement. When holding a microphone during singing or preaching, its best to hold your mic approximately 3 to 4 inches under your chin. If you hold the microphone father away, the sound operator must increase amplification, and unfortunately, when excessive volume must be used to amplify your voice, it may also amplify other surrounding sounds. This makes it difficult to mix or separate your voice from other nearby sounds or singers which may bleed into your microphone. Do not speak directly into the mic, but across the mic, in order to avoid pop caused from your breath. Whenever other acoustic instruments are used, it is very important for all singers to hold their microphone close to their mouth so that their voice is what is heard through their mic, not all the surrounding sounds. 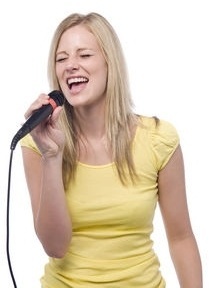 Even other singers can bleed into your microphone, making it impossible to mix the individual voices. How important it is to hold your mic properly. Holding a mic too close can also be a problem. This can create distortion, which makes your voice sound fuzzy and indistinguishable. Avoid a rubber arm. Practice holding your mic at an acceptable distance and learn to hold your arm at a consistent arc which will keep your mic at the right position. If your mic distance fluctuates much, so will your volume, causing difficulty for the sound operator to maintain a good mix. During moments that a microphone is not being used, it should never be held randomly in any direction. If the mic is still live and not used, it should always be held in an upright position, lowered from your mouth if so desired until you need to use it again. Due to the concern in delivering sufficient power to the monitors for the singers to hear themselves, the feedback threshold is often stretched to its limits. By inadvertently pointing the mic toward or near a speaker may create shrill feedback. There is another problem which is caused by holding two or microphones too close together. This is called phase shifting, and creates unpleasant, unnatural sounds. It is advisable to never allow two live mics to come closer than two feet from each other. 1. Dont blow into a mike to see if its on. This sound is annoying and you might blow harmful moisture (spit!) into it. Its a better idea to say something or tap it lightly with your finger. 2. Do not speak directly into a mic. Youll usually create a popping sound, especially if you make a P or T sound. A wind screen on the mic will help to reduce this, but its best to improve technique by speaking across the mic rather than into it. 3. Do not place a clip-on mic under clothing. Although out of sight, the mic will pick up rustling noises as clothing rubs against it, and it will muffle sounds. It is better to clip it on a lapel or wear it around your neck. For stage or TV productions, lavaliere mics can be concealed under clothing if first placed into a silk pouch which reduces noise-causing friction. 4. Do not wear or handle a mic when you step into a baptistry. A hard-wired mic may deliver a serious electrical shock to a person grounded in a pool of water. This danger doesnt exist with a wireless mic, however water and moisture is an enemy to any electronic device and may ruin your equipment. Its better to mount a mic above your head or in front of baptistry. In those unique circumstances when nothing else can be arranged, a hand-held wireless mic, sealed inside a zip-lock plastic bag can be used. The plastic will waterproof the mic, but sound (somewhat muffled) will still pass through. 5. Dont abuse your microphone. Dont drop it, subject it to shock, or hold it dangling by the cable, etc. It is a delicate instrument and may be expensive to repair or replace. Store it in a clean, dry place when not in use. Whenever the sound system is to be used to reinforce the sound for choirs, singing groups, orchestras, musicians, soloists, or special speakers, a sound rehearsal is a absolute necessity. Since the sound system is used as the means to project the sounds of your speech, singing, or music, it is just as important to practice with it as it would be to rehearse playing a musical instrument before a performance. Most of us would not consider trying to sing a song in public without adequate rehearsal in advance. Neither should we ever consider using the sound system with any less degree of preparation. Many people are under the impression that the operation of the sound system is an easy task, as simple as adjusting the volume on the radio. But not so. It is a very complicated process. A 32 channel sound board has about 30 adjustment controls for each channel. This means that there are 960 different knobs and controls with a combination ratio of 144,000 possible adjustment combinations. In addition to the sound board, there are dozens of other components which have multiple adjustments. A piano only has 88 keys while the sound board has 960. If we can understand the complex art of playing a piano and how much training and practice it takes to become proficient, how much more must we realize the need for rehearsal time with the sound system in order to produce professional results. The sound rehearsal is important so that the operator can set volume and mix levels for the main speakers which deliver sound to the congregation. But even more critical to the performer, the sound rehearsal is where the performer fine tunes his or her monitor so they can hear their self and one another. The monitor (or fold-back) system is in reality a separate sound system designed just for the performers and is capable of customizing different volume mixes according to the preference of the performers hearing. It is impossible for musicians or singers to perform together if they cannot hear properly. Note that in the last paragraph I said that the performer is the one who fine tunes their monitor. This is so very important to understand. The sound operator cannot hear your monitor speaker, and has no idea of whether you sing better hearing yourself louder than the other voices, or visa versa. The only way the monitor can be properly adjusted is by the performers direction to the sound operator, and this can only be done during a rehearsal along with the other singers or performers using the sound system. Once again, the only way a sound operator can set the volume for the monitor speakers is during a rehearsal or sound-check. It is not possible to do so during a service or without the directions of the performer. SOUND RECOMMENDATIONS: For small applications (an audience of 100 or so) I recommend the 8-channel Behringer Europort EPS500MP3, a light-weight, inexpensive, good-quality 500-watt sound system with built-in mp3 player. I personally use these powered Behringer speakers, and can't speak more highly of their quality. And since we never want to skimp quality when it comes to mics, I recommend either the legendary Shure SM-58 or the Electro-Voice N D267AS. You can be sure that your voice will be heard with clarity with either of these exceptional dynamic mics. For classroom-sized venues (or smaller churches), I personally use the Behringer Europort MPA40BT-PRO an all-in-One Portable PA System with BlueTooth connectivity. I was pleasantly surprised by the volume and good quality of this miniature one-speaker system. It's incredibly small and portable, and has a built-in speaker pole-mount so it can be lifted up to extend its sound range. It's easy to transport with its built-rollers and collapsible handle, and I'm able to play audio tracks from my smartphone through its BlueTooth connection. With this, I use the wireless Behringer Ultralink ULM100USB microphone, which is designed to work with this unit, and has its own build-in volume control. A great advantage for a preacher! This article (VL-504) is copyrighted © by Dr. Dale A. Robbins, 1990-2019 and is a publication of Victorious Publications, Grass Valley, CA - Nashville, TN. Unless otherwise stated, all scripture references were taken from The New King James Bible, © Thomas Nelson Inc., 1982. You may download this article for personal use as long as you retain credit to the author. Obtain permission before reproducing copies for any reason, by filling out our simple use permission form. Many of our writings are also available as free pdf tri-fold pamphlets, which can be downloaded for reproduction from our Online Catalog. For media reproduction rights, or to obtain quantities of this title in other formats, email us. If you have appreciated these online materials, help us reach the world with the Gospel by considering a monthly or one-time tax-deductable donation.